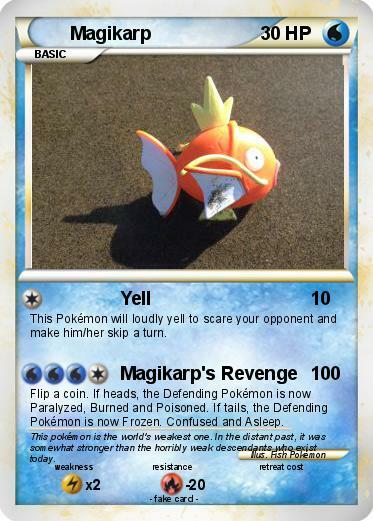 This Pokémon will loudly yell to scare your opponent and make him/her skip a turn. Flip a coin. If heads, the Defending Pokémon is now Paralyzed, Burned and Poisoned. If tails, the Defending Pokémon is now Frozen. Confused and Asleep. Comments : This pokémon is the world's weakest one. In the distant past, it was somewhat stronger than the horribly weak descendants who exist today.